Welcome to Make It Monday with Kraft Outlet. Use this week's "Happy Harvest", theme to inspire you to create your project and then link it up at the bottom of this post before 6:00 p.m. (Eastern Time) on Sunday November 11, 2012. All of our followers who participant in our challenges this month have a chance to be featured on our "Feature Me Fridays" posts as well as be entered to win a $15.00 Kraft Outlet Store Voucher! The more challenges you enter this month, the more chances you have to win! Before we reveal our Design Team's inspiration projects for this week's challenge we would like to formally introduce our newest Design Team Member. 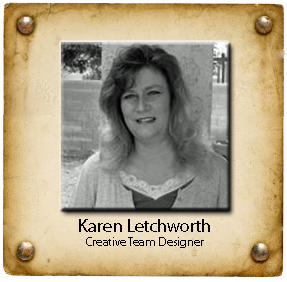 Please help us to warmly welcome Karen Letchworth to Kraft Outlet and The Kraft Journal Design Team! We just know you're going to be inspired by her work and we are excited to have her on the team! To learn more about Karen, read her bio on our Design Team page and be sure to visit her blog too! 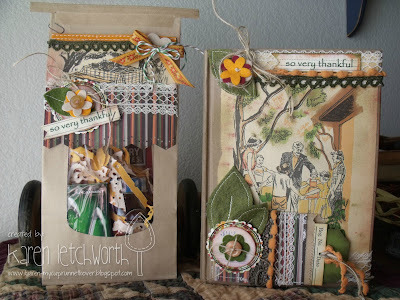 Let's take a peek at what our newest Design Team Member, Karen Letchworth, has made using the Natural Crinkle 5x7 Journal, the Small Kraft Coffee Bag With Window, and lots of cute "Happy Harvest" decorated embellishments from the Kraft Outlet on both. The Small Kraft Coffee Bag With Window is filled with a candle, some tarts, candies and gum. It's embellished with patterned paper, laces and trims, jute, a Tim Holtz Memo Pin, some felt flowers and leaves, a partial page from a vintage story book (picnic table), and Karen used the Jenni Bowlin Memo Book to print off sentiments on the computer and cut them into strips to use on her project (so very thankful). Karen used the gorgeous 5x7 Natural Crinkle Journal to create a Prayer Journal/Book of Thankfulness and Blessings. These lovely journals are lined on each page for easy hand-writing or note-keeping, and make great gifts. 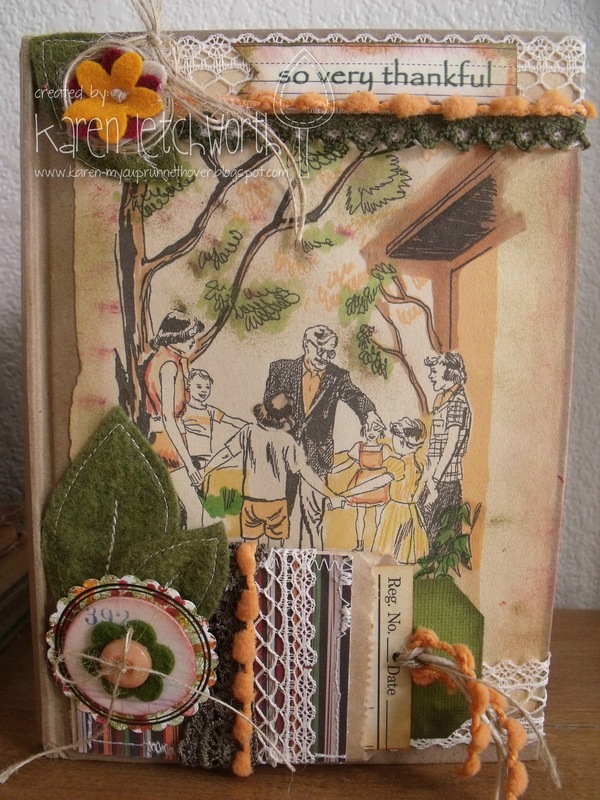 The background of the journal is a page torn from a vintage story book that Karen has colored in a bit. The bottom tag is made from a Mini Lunch Bag Kraft Envelope with one of the Jenni Bowlin Journaling Cards cut down into a tag to tuck inside the pocket. The flower is made from felt leaves, a journaling circle, a vintage button with some jute, and a Jenni Bowlin Chipboard Buttons/Office. Visit Karen's blog for more details and photographs. For Becky's project this week she chose another vintage post card image. The verse says "Now let the good old crop adorn the hills our fathers trod. Still let us for His golden corn, send up out thanks to God." For the base of the card Becky used Lunch Bag Kraft card stock. The label of brown cardstock was cut using her Cricut. The bow is made of Hemp Cord, with a Jenni Bowlin button and a couple of vintage buttons. You can find more info on this card on Becky's blog Becky Garrison Paper Crafts. 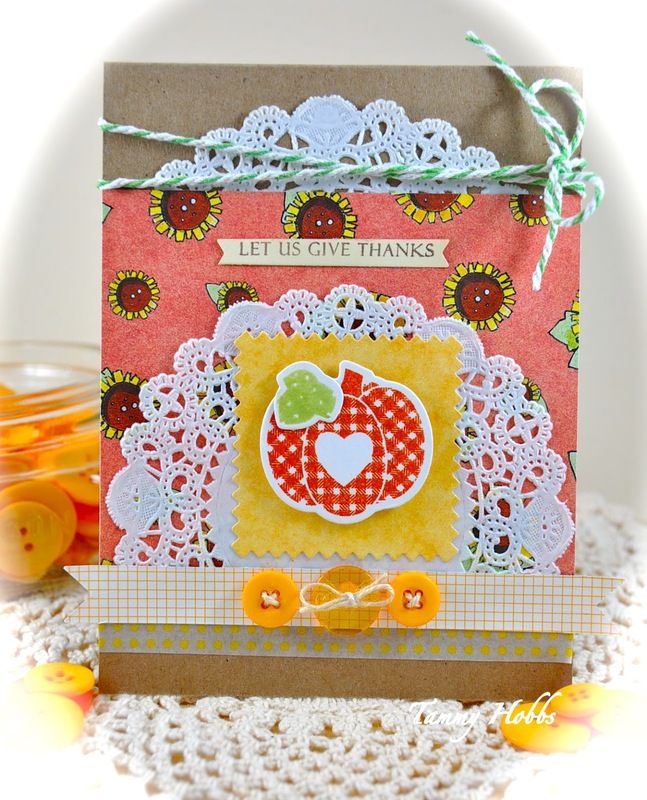 For Today's Happy Harvest challenge, Tammy began with a card base of Lunch Bag Kraft and used lots of layering which consisted of doilies, patterned papers, twine, and decorative tape. The image was die-cut and stamped and mounted with foam adhesive. The sentiment was cut into fishtail banners onto Buff Ivory Cardstock. Last Tammy finished off by adding some buttons by tying off using some Natural Hemp Cord. Please visit Tammy at Creating Somewhere Under the Sun for more information and photographs. For today's 'Happy Harvest' challenge, Debbie created a 3-D pumpkin made from scalloped die cut circles with a wooden dowel adhered at the center for the 'stem'! Deb wrapped a snipett of green tulle around the wooden dowel for some pumpkin greenery and created two pretty leaves from a scrap of Burlap. A nosegay was created at the base of the stem by die cutting several rolled flowers from Buff Ivory Card Stock and adhering them to the dowel. A length of Adelaide Brown Seam Binding was made into a loopy bow and attached to the base of the flower bouquet. A shabby little tag was created by inking a Small Kraft Shipping Tag. The sentiment was stamped using the Happy Fall Ya'll stamp set from Paper Sweeties. A snipett of green pom-pom trim was machine sewed onto the tag and then a button, Tiny Colored Wooden Clothespin and glittered chipboard star were adhered onto the tag. Another rolled flower made from Buff Ivory Card Stock was glued onto the tag and lastly the tag was attached to the pumpkin with some Green Baker's Twine. Please visit Debbie's blog, Simple Treasures, to view additional pictures of her project. Beautiful work ladies! Welcome Karen!!!!! Yay!! I love Karen's work. She's a great addition to your talented team.